Our Story - Fairfield Media Co.
Fairfield Media Co. was founded by Scott Towne in 2012 with the goal of creating a digital content & design firm that is built on integrity and friendly, personal service. Scott's mission is to create a ‘whole package’ experience for his clients so they don’t need to rack up the expense of going to different places for web design, content creation, branding, logo design, social media and marketing strategies. For more than 12 years, Scott produced and designed blockbuster video games at large software companies where he honed his skills in user interface design, project management and software development. Through those years working closely with people to make great games, he learned the importance of fostering dynamic collaboration to reach and surpass project goals. He is now using his creative and technical drive to create cohesive communication channels for small-business owners. Scott studied Philosophy at the University of Victoria and completed certification as a Digital Business Consultant with WP Elevation. 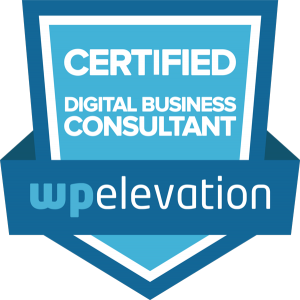 WP Elevation is a global business mastermind group for WordPress consultants that helps its members better serve their clients through communication, development workflow and project management best practices. WP Elevation gives its members access to ongoing education and a community of peers for support and continued professional development.